Readers may also be interested in a series of Circus-themed events taking place at the Central Library from today and over the next week – further details can be found on Leeds Inspired. Mr Kite erected his New Olympic Circus on ground between Commercial Street and Boar Lane in June 1810. He returned again in 1811 when he opened a ‘commodious circus’ on the same site. As well as running his own circus, Mr Kite was an adept performer and appeared with several companies during his lifetime. His name was immortalised by the Beatles in their 1967 song ‘Being for the Benefit of Mr Kite’. The Third White Cloth Hall was once the West Riding’s premier cloth market. Dating from 1775, its open yard provided an occasional venue for Pablo Fanque’s Allied Circus between 1856 – 1858. One of the first references to a circus on Boar Lane was for Mr Adam’s New and Elegant Circus, near the Lancastrian School, in 1816. The Lancastrian School was on Alfred Street, just off Boar Lane. Cooke’s Olympic Pavilion opened in June 1822 and Cooke regularly presented performances at this venue for the next twenty years. The circus was often rebuilt and in February 1841 it was announced that there would be the ‘erection of a spacious circus on the vacant ground between Trinity Street and Bank Street … for the use of Mr Cooke’s superior equestrian stud’ (see map above). The other two streets bordering this plot of land were Commercial Street and Boar Lane; the main entrance being on Boar Lane. Many other circus companies used this site through to the 1860s; Batty’s New Circus Royal; Franconi’s Cirque National de France (the Franconi’s were the ‘founding fathers’ of the French circus); Pablo Fanque’s Royal Circus; Bell’s Great United Hippodrome and Circus; and Sanger’s Grand Circus. There are two references to a site at the ‘top’ of Albion Street being used for circus performances, in 1811 and 1812. Bannister and West presented their Olympic Circus in the July of both years. 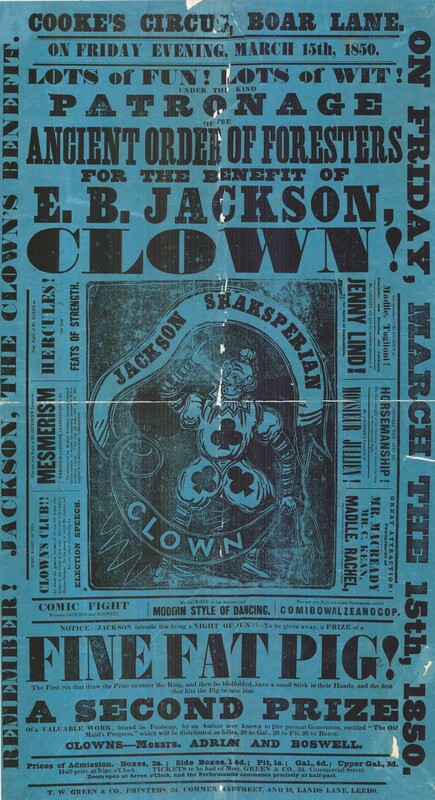 This circus had earlier appeared at Astley’s Royal Amphitheatre in London and included two of the earliest ‘star’ female performers; the Bannister sisters. Miss S. Bannister was a renowned performer on the slack–wire, and her sister, just plain Miss Bannister, was an accomplished equestrienne.